CANTON, Mass. – Saturday afternoon’s Div. 2 South matchup between Canton and Medfield at World War II Veterans Memorial Field was intense. Both teams pressured high up the pitch, the ball rocketed back and forth from one end to the other, and no one had more than a second on the ball to try and make a play. In evenly matched games between good teams, sometimes it takes one moment of magic to decide the outcome. 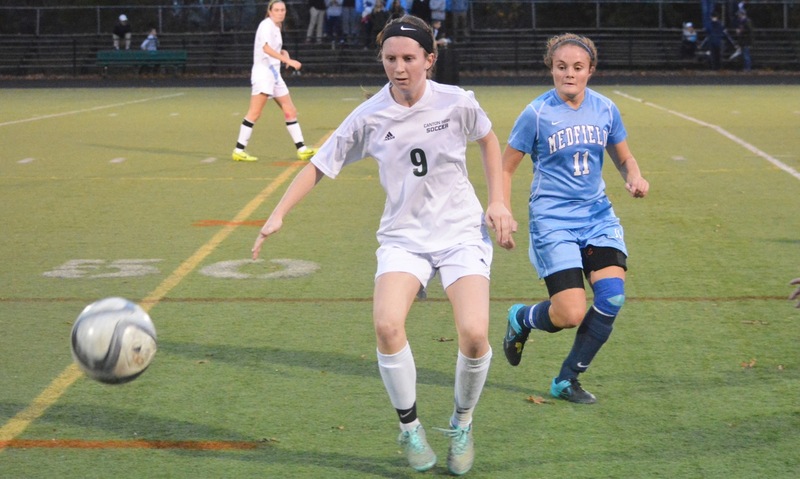 On Saturday, that moment of magic was provided by Medfield right back Sydney Joline. 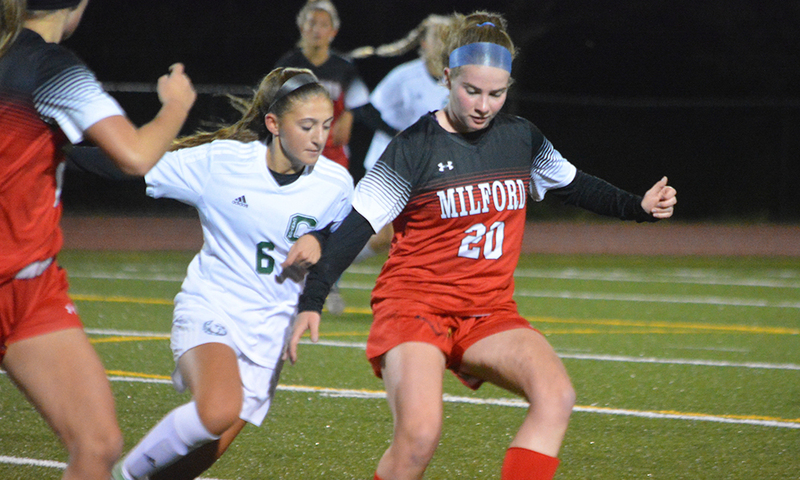 The junior lined up a 25-yard free kick from the right side of the penalty area with 10 minutes remaining in a scoreless game. 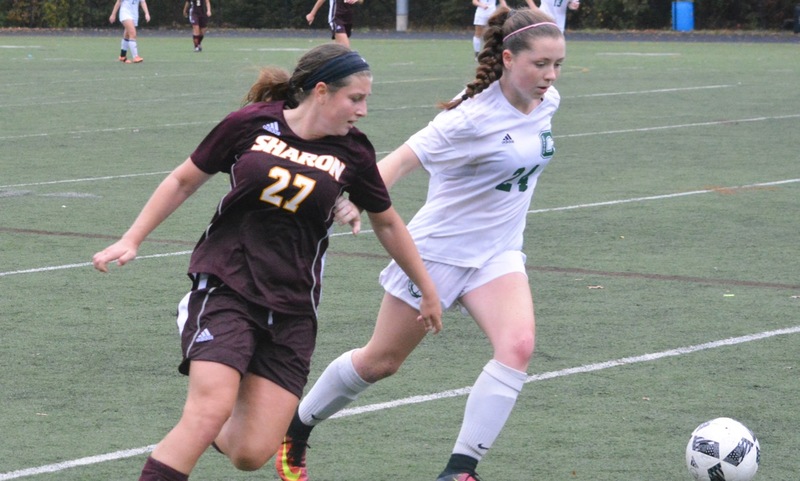 The angle and distance would normally require a cross into the box, but Joline was urged to shoot by the Medfield bench and she cooperated with a rocket that snuck just inside the far post breaking the deadlock and Canton hearts. 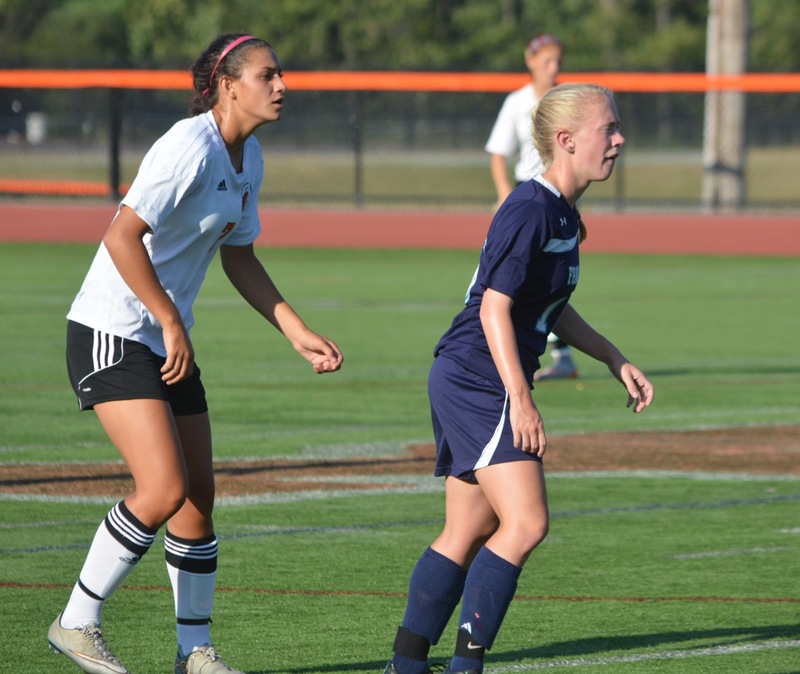 Medfield tacked on another goal in the final minute and came away with a 2-0 victory over the Bulldogs that moved the Warriors on to the sectional semifinal and a matchup with Notre Dame Academy (Hingham). 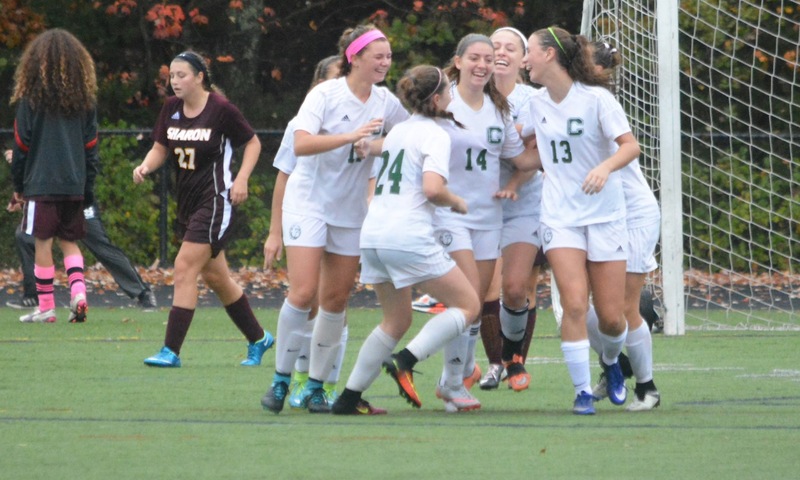 Canton had the first shot on goal in the third minute. 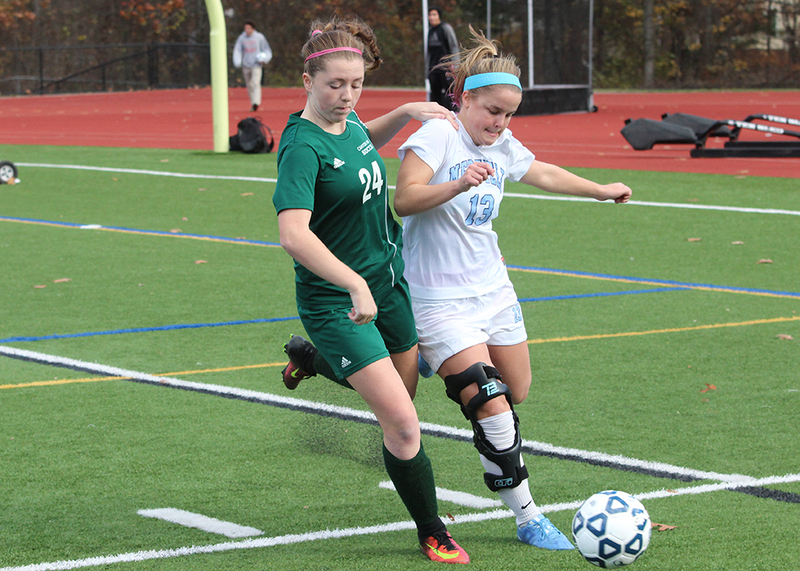 Tessa Cudmore taking a shot from the edge of the box that was right at Medfield keeper Sarah Graham. A minute later, Medfield had its first chance when Canton keeper Kathryn Doody failed to handle the first shot that led to a scramble in the box. Doody ended up making two big saves before the ball was cleared. Joline fired warning shots in the 20th and 31st minute. One free kick from the right sailed narrowly over the crossbar and her shot from the left forced Doody into another save on a tough dipping shot that bounced a foot in front of the keeper. The Bulldogs had probably the best chance of the game in the 33rd minute. Sarah MacQuarrie spring Cudmore with a through ball in the left channel. Graham came out to the edge of the box but was unable to handle it cleanly and Cudmore touched it past the keeper. With the goal gaping, but at a tough angle, she missed the far post by inches. The second half was played almost entirely in the midfield with neither team able to create consistent scoring opportunities. As the clock continued to wind down and the pressure ratcheted up, both teams became increasingly frenetic. 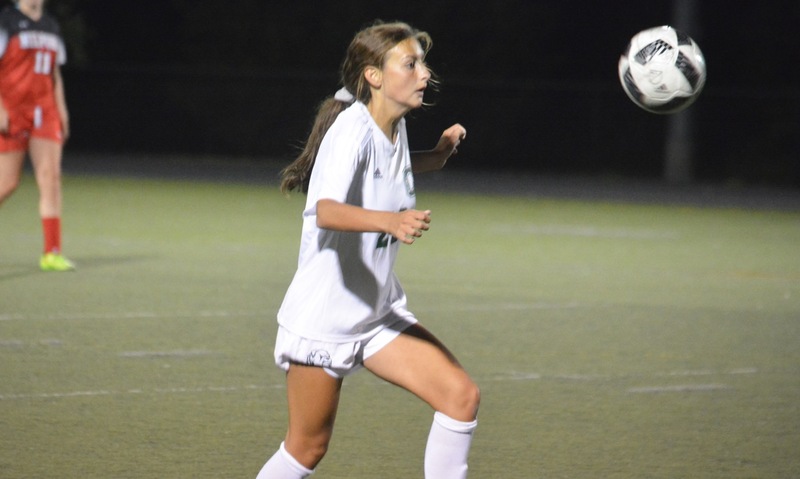 In the 70th minute, Joline struck for the Warriors and changed the way the game was being played. 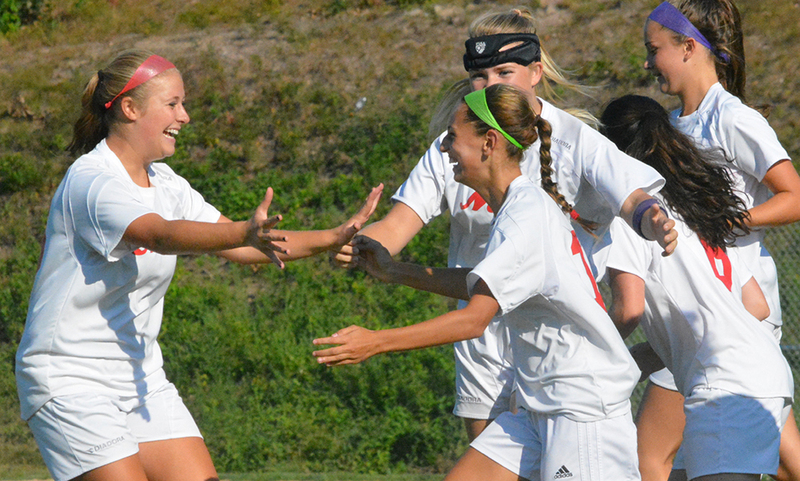 Canton needed to push forward more and take more chances. 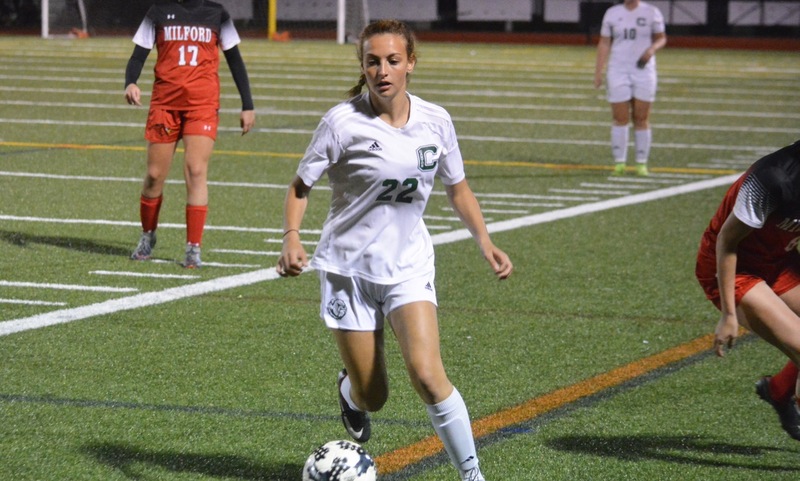 In the 74th it almost paid off for the Bulldogs when Cudmore had a breakaway down the right channel only to be denied at the last minute by Medfield left back Sarah Crofts. MacQuarrie also had a shot from he edge of the box that forced Graham to get down well to tip it around the post. The ensuing corner was cleared. 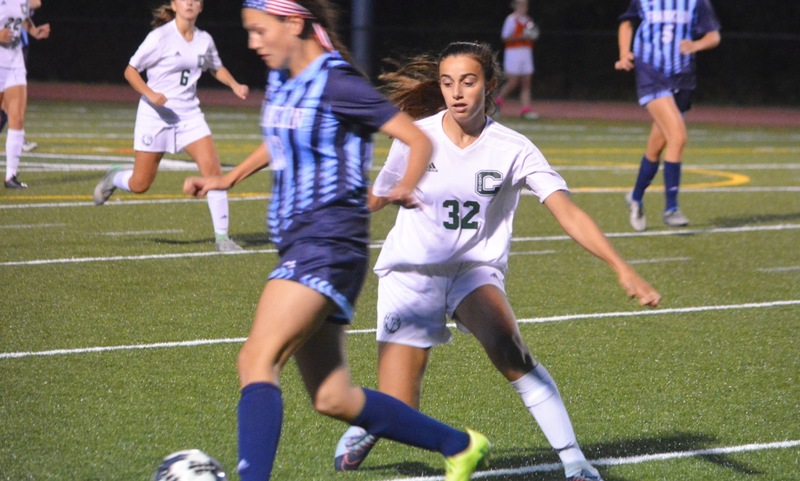 In the final two minutes, Medfield had a throw in deep in its attacking third and the ball bounced into the penalty area where Maggie McCarthy slid across to knock it past Doody. Howarth praised the back four of Shannon Foley, Sarah Connelly, Hayley Mulford, and Sarah Collins for keeping Medfield at bay. Other than a chance in the first half, the Warriors striker Taylor Sherman has little impact on the game. Overall, Howarth was proud of her team, while also disappointed in the one chance the separated the teams.